City of thousand temples welcomes you. Kanchipuram district is situated on the north-eastern coast of Tamil Nadu, adjacent to the Bay of Bengal and Chennai city. It is bounded in the west by Vellore and Thiruvannamalai district, in the north by Thiruvallur district and Chennai district, in the south by Villupuram district, in the east by Bay of Bengal. 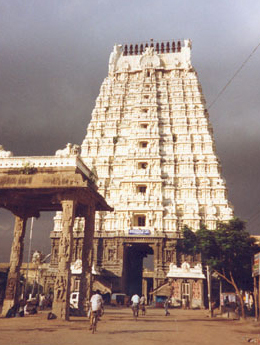 Kanchipuram, the temple town is the district headquarters. Kanchipuram- "Golden City Of Temples" was believed to be the most attractive city of ancient India. This city is one of India's seven sacred cities and is considered the second holiest place in India next to Varanasi. It was under the Pallavas from 6th to 8th century A.D. after that it was briefly occupied by the Chalukyans of Badami, and by the Rastrakutas when the battle fortunes of the Pallava kings reached a low ebb. The remains of a few Buddhist stupas here also bear testimony that Buddhism also prevailed here for a while. One of the Acharya Peetas of Sri Adi Sankaracharya - The Kanchi Kamakoti Peetam is situated here. It has been a centre for Tamil learning and Culture for centuries and gives us a clear picture of the glorious Dravidian Heritage of the Vaishnavites	and	Shaivites.